Last week I asked the Microsoft data professional community to give back… and you did. We generated 29 blog articles with inspiring stories of past contributions, advice to those beginning their journey, and plans to do more. A recurring theme was how helping others ultimately helps you– with both personal growth and professional recognition. My overarching goal was to get more people doing more things for the community. I hope the tales and goals shared this month provide the motivation for more action and continued growth of our community. I must admit that I almost made a big mistake with my topic selection. I was so blinded by my vision of new bloggers, speakers, and mentors that I didn’t realize the hubris of asking some folks to do even more. 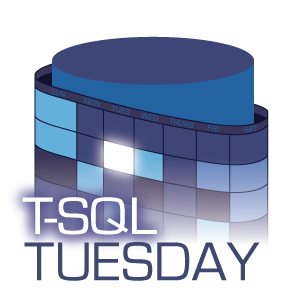 I neglected to consider that that many T-SQL Tuesday participants are already engaged, active members of our community– MVPs, prolific speakers and bloggers, and even literally legendary Q&A contributors. I had provided an escape value– a good topic in its own right– of a favorite SQL Server 2017 feature. That helps everyone realize the benefits of upgrading, which keeps our ecosystem current and generates revenue for Microsoft to continue improving the products we all use. But I’d missed an obviously better choice– something thematically related but tailored to industry veterans. Instead of asking even more of those already giving of so much, why not give them an opportunity to inspire the next generation, guiding and encouraging them to make their own contributions? I’m glad that I listened to my nagging doubt and updated the post the next morning with that topic tweak. And I’m grateful that many approached this month’s event from that perspective. Initially, I had planned on a comprehensive grid with dates, sources, titles, topics, and individualized comments. But wide tables look bad and function poorly on mobile. So after building all of the HTML, I decided to pare it down. Rather than more manual editing, I thought I’d leverage our favorite tool, SQL Server, to do my work for me. HTML is basically XML, especially something as simple as a table, and SQL Server can parse XML. SQL Server can also make XML, which is basically HTML. Put those together and T-SQL is a general purpose HTML table reformatting system. So I copied the HTML straight from the WordPress editor and pasted it into SSMS. Then I encoded single quotes as double single quotes (using find and replace) and put it in a string. Using the XML nodes function provided access to each table row as a SQL table row, and the XML values function allowed extraction of the various URLs and data elements. Once I had the data represented in a derived table, I could sort and manipulate it, and then gather it back up into XML using FOR XML. The results can be pasted back into WordPress and saved– instant table in a new format, sorted as desired. I was even able to use SQL Server’s recent AT TIME ZONE function to ensure that (almost) everyone posted when it was “Tuesday somewhere”. With some windowed aggregates, we can also see that 22 authors commented while 7 just tweeted. And using my quick categorization of the posts, I verified the need for the alternate take on the topic, since almost 60% (17 of 29) gave some form of advice or personal history. See the full script of this process of HTML table reformatting using T-SQL on GitHub. And technically, since this is a technical topic, I’m already half way to accomplishing my goal “to write at least two instructional blog posts before the end of the year”. Here is the full list of posts, sorted by perspective on the topic and then submission date. I promised that I would help hold the planners accountable by checking in with them at appropriate times. I will update this with a list of key goals and dates for follow up. Rob explains how speaking is the natural evolution from teaching your coworkers. He reminds us that the audience is “on your side”. Kenneth explains how blogging both helps other people and creates an online resume. Organizing and speaking is fun, it helps you learn, and a blog provides a reference for you and others. It also pays back all the benefit you’ve gained. “Blogging helps you become a better technical person.” Plus it saves time in the long run; write once, read many. Speaking makes you double-down on prep, which cements your learning and makes you a better presenter. Helping others also enhances your personal life. Thomas Hütter Developer, speaker, blogger – how did all of this happen? Like me, Thomas had to be convinced to start speaking. He started with his local PASS chapter and then on to a SQLSaturday– with Steve Jones in the audience. Cláudio began learning about SQL Server through SQLServerCentral and print magazines. Then he explored other blogs, then user groups and SQLSaturdays. With encouragement, he began speaking and then working with dbatools. “We all love to give back and help each other.” Her laptop wouldn’t cooperate for her first demo-laden presentation, but she gave it anyway. And then again the next week. She’d been “bitten by the speaking bug” and is now a mentor. She also blogs and is riding the SQL on Linux train. Peter details the long history of helping in our community and notes that he has’t “seen this level of sharing in many other tech communities”. He blogs, speaks, and contributes on StackOverflow and SQL Slack. He encourages every else to get involved: “you probably know something that nobody else does”. A 23-year MVP, Steve got his start in Microsoft Access, answering questions on CompuServe. He eventually migrated to SQL Server and then System Center Configuration Manager. He explains that speaking is fun and benefits your career. Like so many others, a local user group and SQLSaturday were Björn’s introduction to PASS. He started volunteering at conferences, founded a meetup, and eventually spoke at a SQLSaturday. He also confirms that speaking is fun and helping people makes you happy. We already knew Aaron was legendary, but Stack Exchange confirmed it for us. He’s been answering questions online since before that was a thing. Then he started blogging for efficiency and reach. He focuses on best practices to “help the helpers”, hoping to spread good habits. Ultimately, as with so many others, he’s “just trying to help people”. And he wants you to know you can, too. Kathi describes how PASS Summit 2004 changed her life forever, prompting her to immediately sign up to volunteer for PASS. She didn’t realize how much she was helping others or how it would open doors for her. But now it’s clear she’s “making a difference in the world”. She says you’ll be glad when you, do, too. Allen started getting involved in PASS by bringing knowledge back from Summit to his local community. Eventually he led that local group and about a decade later he’s part of the global PASS leadership. He echoes that “the more you give, the more you get in return”. First time participant Tim explains how he learned about SQLSaturdays at Summit and shortly thereafter attended one, then spoke at one, and then organized one. He continued volunteering, blogging, running a user group, and was hired at SQLskills. Hearing that he’s helped someone makes all the hard work worth it. Nate blogs to help himself remember, in addition to helping the community. He’s attended SQLSaturdays and hopes to volunteer in the future. He also hosts “lunch and learn” events at his company. He reminds us that having to teach something forces you to learn it really well. Finally he cautions that, while being generous with your time really does make a difference, don’t forget to prioritize yourself and your family. Andy claims he consumes more than he contributes, which is striking since he’s been an author of 11 books, has built open source SSIS utilities, blogs, and speaks at SQLSaturdays. He’s lived the “virtuous cycle” in the SQLServer community. Answering more questions than he asks. Submitting to speak at 3 SQL Saturdays. Attending 80% of the local user group meetings. Creating 6 technical blog posts and 10 T-SQL Tuesday posts. Releasing a reusable solution into the community. Deb plans to volunteer to help first timers at PASS Summit. She’s also considering submitting to speak at a virtual group or GroupBy.org. She emphasizes that it’s ok to help behind the scenes or in little ways. There’s a way for everyone to help. Rich has been helping one-on-one, but commits to run one lunch-time training course per month for at least a full year for his coworkers. He’ll also make the recordings available internally. Kevin is taking mentorship to a new level by running an apprentice program. He’s looking for his next recruit, especially among folks who don’t have the same opportunities as many in the tech industry. Shane has been blogging weekly, is a contributor to dbatools, and has volunteered at SQLBits. He plans to contribute more to open source tools, submit to speak at SQLSaturdays, and write deeper technical blog posts. A new website is born with the creation of Hugo’s SQLServerFast.com all about execution plans. By the end of the month, he will publish his first set of articles, with a new one arriving each month. Another first time contributor brings us another new website. Janice rekindled her local user group, organized her first SQLSaturday this March, and began speaking. She’s planning on submitting to more speaking opportunities this year and she will continue her work organizing the PASS Professional Development virtual group. Doug has adopted the Getting Things Done time management process and commits to writing a series of blog posts on how we can all get started… and presumably how we can finish, too. Originally worried about not having “anything worth sharing”, Jess is now convinced we all have something to teach. She’s committing to 6 more blog posts this year (3 technical), 50 merged pull requests into the dbatools module, and to present at a user group meeting and (hopefully) a conference. I planned to volunteer for NDC Minnesota, work on diversity in tech by encouraging new presenters and host a panel on that topic at our SQLSaturday on October 6th, run for another term on the PASSMN user group board, and write two instructional blog posts by year’s end. PROJECT SQLImaginarium has officially launched. Todd will use virtual reality to introduce folks to SQL Server. It will provide an immersive experience and will enable users to visualize how the engine works in ways never before possible. But he needs your help to make it work. We’ve heard stories of growth– from answering questions privately, to answering questions publicly, to blogging for the world to see. We saw folks get started by teaching their coworkers, then their local professional community, and then conference audiences small and large. We watched as they built the tools many of us use every day. We were reminded that everyone has something to share. We all have a unique perspective to offer. And no contribution is too small. We’ve been shown that we grow as we help others grow. And that, in addition to being fun, helping others helps ourselves. I’m excited to see what we can all accomplish together. Thank you, everyone, both for all you’ve done and will do for each other and our community, and for making this T-SQL Tuesday a success. Update 2018-05-23: In reviewing my comment spam queue, I noticed Andy Leonard’s entry today and added it to the list. Sorry for the initial omission. This entry was posted in Tech Community and tagged #tsql2sday on 2018/05/15 by Riley Major.